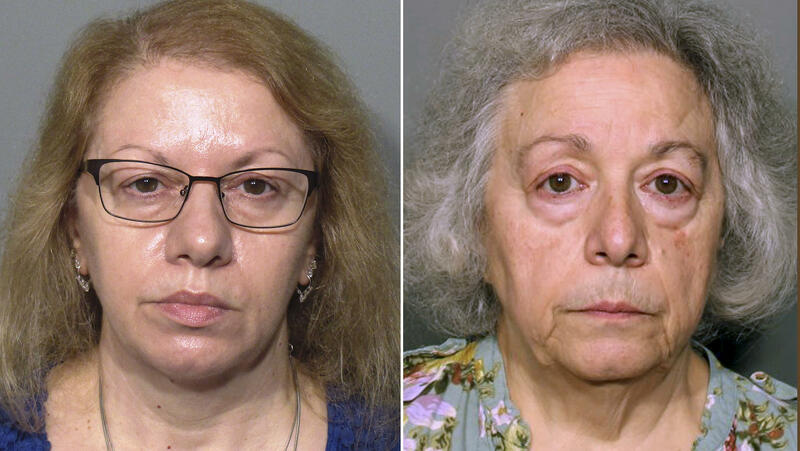 Joanne Pascarelli (left) and her sister, Marie Wilson (right), have each been charged with one count of first-degree larceny. Investigators say the New Canaan, Conn., schools where they worked lost a combined $478,588 in lunch money between 2012 and 2017. In the grand pantheon of cafeteria misdeeds, few are more dastardly than the crime of stealing lunch money. And popular culture offers up no end of usual suspects, from vindictive older siblings to schoolyard bully. But in New Canaan, Conn., the whodunit has taken a new twist. Police say two unusual culprits are to blame after two public schools mysteriously lost nearly $500,000 of lunch money in a five-year span — the cafeteria workers behind the register. Sisters Joanne Pascarelli, 61, and Marie Wilson, 67, surrendered to law enforcement last weekend after warrants were issued for their arrest. Each woman has been charged with one count of first-degree larceny for allegedly carrying out a scheme that from 2012 to 2017 robbed the cafeterias at Saxe Middle School and New Canaan High School of about $478,588 in cash. If convicted, each woman could face up to 20 years in prison. "We are deeply upset by this alleged violation of our trust and the trust of the entire community, and are committed to continuing our full cooperation with the New Canaan Police Department regarding these allegations," the New Canaan Public Schools superintendent, Bryan Luizzi, said Monday in a letter to the community. "The alleged crimes involve a specific fund, the cafeteria fund, which is separate and apart from the district's operating budget," Luizzi added. Both women have denied the charges. "I would never take money," Pascarelli told police during an interview earlier this year, according to the arrest warrant. "I know better than that." "There is certainly more to this story than what is in this arrest warrant," one of Wilson's attorneys, Christine Landis, told NPR on Tuesday, adding that they plan to make their case in court. Pascarelli's attorney did not immediately respond to NPR's request for comment. The arrests were more than nine months in the making. The school district traced "irregularities related to the handling of cash" to Pascarelli and Wilson, who police now believe to have been skimming cash from the registers. Pascarelli led the food program at the middle school, while Wilson worked as assistant food director at the high school — at least, they did until they resigned under pressure from the Board of Education last December. Later that month, the board passed along the complaint to the investigations unit of the New Canaan Police Department. The police say that their review of records and interviews with witnesses revealed a suspicious pattern of behavior: cash not entered in the registers, deviations from standard procedure and retribution for other workers who spoke up about it. What's more, police say there was another convincing piece of evidence: After Pascarelli and Wilson left their jobs, the average daily deposits from the cafeterias leapt considerably, despite school enrollment remaining steady. At Saxe Middle School, for instance, the average daily take hovered around $33; so far this year, the average is more than five times that amount, at about $184. All told, authorities say Saxe lost an estimated $128,000 and the high school lost more than $350,000 in the five-year period. They add that the thefts may date back as far as 15 years, though police say they were able to go back only five years in their investigation. Pascarelli and Wilson are each out on $50,000 bail and have court dates later this month.